GULFPORT, MS (WLOX) - Some 1,700 public high school students in Gulfport now have a new place to call home. 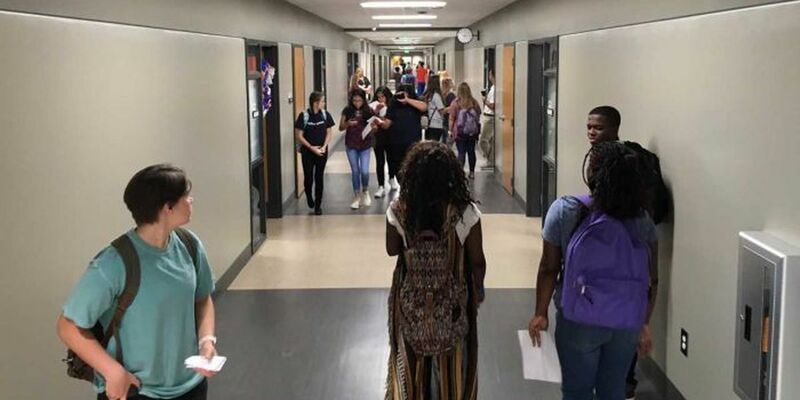 They moved into a new $40 million high school, where classes began at 8:20 a.m. sharp Tuesday. As students walk in for the first time, the loudspeaker announcement said it all, welcoming students to their new home away from home. There were plenty of hugs and handshakes, as well as accolades for the new school from student Genevieve Goldsworthy. "I think it's absolutely amazing. It's stunning, and it's a lot different than last year," said Genevieve. Teachers could barely contain their excitement. One of them was Amy Lee. "It's super impressive. Gosh, if I would have had this when I was in school, things would have been so different. I'm so excited for the students, the faculty, and everyone else," Lee exclaimed. The state of the art school will offer just about everything, including a better learning experience for student Matthew Wingerter. "Well, it's great, because projects in school are going to be a lot easier to do now, because everything is going to be a lot faster, and it will make it easier for us to work," said Matthew. Marketing teacher Charles Tucker agreed. "I feel great. I mean, to teach in this environment with this state of the art equipment everywhere in every classroom, so if you have to switch classrooms, you're not missing any technology," Tucker explained. While everything in this new $40 million school is brand new, from the lighting, to the desks, to the computers, to the furniture, something else is new, too. That's the way we're teaching our kids in 2017, getting them better prepared for the work force. "We also want to take what they're learning in the classroom and give them an opportunity to be able to do a hands-on opportunity and an experience with that," said Principal Mike Lindsey. That experience is going to leave a lasting impression for students like Alyssa Smokes. "It looks very nice. I love it, because it's more of an educational environment, so it makes me feel comfortable," said Alyssa. All the construction is still not finished on the 200,000-square-foot complex Still to come is a practice gym that will offer physical education classes. That should be finished by March of next year.